This deliciously healthy and low calorie Stuffed Cabbage Saute is a variation of traditional stuffed cabbage rolls, which is a popular Polish recipe. 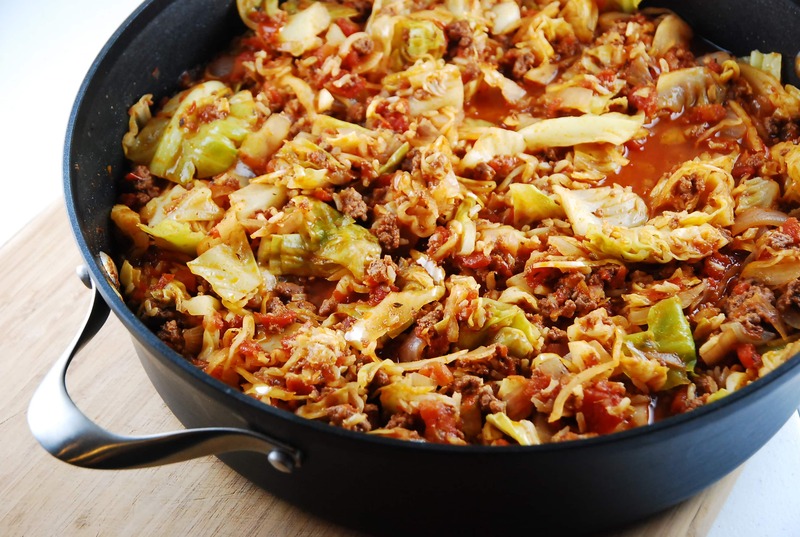 However, making stuffed cabbage rolls can be a pesky and time consuming task, but my simpler sauté version in all prepared in one pot making it an easy Weight Watchers recipe that anyone can successfully prepare. It’s low in fat, high in fiber and protein, and has that wonderful sweet and sour taste that I’ve always adored in stuffed cabbage rolls. I love that it offers a great way to fill up while still staying within your Weight Watchers Points budget. This easy and flavorful dish was a huge hit at my house and something I’ll be making again and again. Enjoy! What a great family meal that is not only delicious and satisfying, but very light. It’s sweet and sour taste is reminiscent of traditional stuffed cabbage rolls, but this saute is a lot less work. Hello! I love your recipes. Especially this one. Just a quick note though. When I use my recipe builder to calculate points the points per serving are actually 7 points plus not 4. Just so everyone can budget accordingly. I was really excited to try this recipe, but have run into a few snags. I realized I needed more info since it is a bit vague. It would really help if you included stats such as: 1lb of lean ground pork, try to stay around 120 calories for 4 oz or 98% Fat Free – something else to help us find the ingredient you are mentioning, since I assume you can’t mention labels. There are so many different cuts out there 70%, 80%, 95% lean, I’m not sure which one you’ve included. Thanks! I was very disappointed in this recipe. I cannot put my finger on what exactly I disliked, I think possibly I did not like the sauerkraut and vinegar taste, and that it may be better not adding these ingredients. I’ve loved everything else on the site, but unfortunately not this one. I love all your recipes as well but I felt the same way, I think it was the vinegar and sauerkraut. I would make it again but skip those ingredients. So far every recipe I’ve tried has been absolutely delicious but this dish is my favorite. I found it easy to make, low in points, generous portions and bursting with flavour! Please keep the recipes coming Laaloosh!! Would the leftovers of this freeze well? You said in your blurb that it is sweet and sour. I know the sauerkraut is sour, but what is in it to make it sweet? It does sound really good, but we don’t eat pork, so I will use half ground beef and half ground turkey. I just wanted to print your recipe and got all the pages – comments +. Just wanted to try your great sounding recipe. I guess no one noticed, but it says uncooked brown rice..simmer for 5 minutes…I assume you meant cooked, but that doesn’t seem like much rice…what about the instant brown rice? I made this last night and it was fantastic! So satisfying for 4PP. I used ground turkey because I couldn’t find ground pork, and it worked well. I love all of your recipes, but still use the old points value. Is there anyway to get both values? Thanks! Rachel, I make sure to include the necessary nutritional stats so that you can calculate the old Points, if needed. I no longer have my old Points calculator, so Im unable to calculate them myself. Is there anyway to start getting the old point values on the recipes again? According to my Points Finder Slide this recipe is 3 points on the old system. YUMMO!!!!! I actually turned it into a personal lasagna by using a square ramekin and layering this deliciousness in between 4 wonton wrappers, topped with about a Tablespoon of parmesan cheese, and baked for about 15 minutes. It was sooooo good and only added about 3 pounts+. Thank you so much for sharing!!!!! What is the sodium content for this recipe? I’d love to try it as a simple way of doing stuffed cabbage, but I must know how much sodium. Tom, I calculated this on myfitnesspal.com, and with 8 servings, it came to 111 mg sodium per serving. It’s mostly from the sauerkraut. But I did use canned petite diced tomatoes. Using fresh chopped tomatoes would bring it down to about 80 mg. This is what I’m trying tonight! Looks delicious!! I did make this tonight and it was so tasty! One and a third cup is really the perfect size! Will surely make this again! I only use ground lean turkey, what would the calories be? Where do you buy lean ground pork? I’ve always known ground pork is very high in fat. Do you grind a pork tenderloin or ask butcher to do so? I made this yesterday, but used lean ground beef rather than pork as we can not readily get ground pork where I am at. It was wonderful!! I will be making this a regularly! When I need ground pork I ask them to grind it for me at the grocery store. I have had them grind pork tenderloin or lean pork stew cubes, both with success (and much less fat!) I am thinking that the boneless butterfly chops would work well too. I’m sorry I see that it is 1 1/3 cup. I’m half Polish and I love stuffed cabbage! I am eager to give this recipe a try. A couple quick questions…does the sauerkraut go in with the diced tomatoes, tomato paste, et al? And I assume the sauerkraut is drained and maybe rinsed before adding? Oh geez, I realize that I made a typo and didn’t include the sauerkraut in the instructions. It goes in with the diced tomatoes. And it does not get drained and rinsed before putting it in. I don’t think there’s a day that goes by that I don’t ZipList your recipes! WOW!! I can’t wait to try this. Love stuffed cabbage, easy and just 4+ points! !